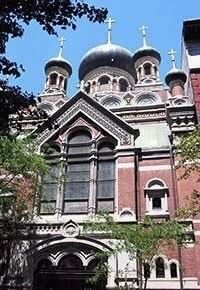 In 1894, a small congregation of Russian immigrants held fast to their traditional religious beliefs from their homeland. With little money, the group worshipped in a rented house on 2nd Avenue. By the turn of the century the congregation had grown to 300 and a permanent church was necessary. In 1899 a mid-block lot was purchased far uptown on 97th Street just off 5th Avenue where land was still relatively inexpensive. The congregation did not have the funds to erect a church. Dean Alexander Hotovitsky, the minister of the group, was put in charge of the fund raising. And he went right to the top. Hotovitsky traveled to Moscow to plead his cause. One of the first contributors was Csar Nicholas II who donated 5000 rubles (about $2,500 at the time). Two years later the cornerstone of the 70 by 100 foot mission church was laid during an elaborate ceremony. Present was the crew of the Russian warship Retvizan which was being constructed in Philadelphia. The church was completed in 1903 on the designs of architect John Bergesen. The architect is most often said to be Russian; however he variously cited his birthplace as Sweden or Finland. The new structure was a slice of old Moscow dropped onto 97th Street. If the congregation had no money when they started the project, the finished structure gave no hint of it. Exotic onion domes clustered above the red brick and limestone façade which was decorated in green, yellow and blue glazed tiles. Gilt bronze ribs stood out against the painted surfaces of the domes. Inside was a blaze of traditional Russian decoration. Bright multicolored frescoes adorned the walls and ceilings, an immense crystal chandelier illuminated the gilt detailing and highly polished marble. To cross the threshold was to leave New York and enter Russia. Later, however, the Russian warship Retvizan whose crew had been present at the church’s cornerstone laying was sunk. The cross from the ship’s chapel was brought to St. Nicholas. “One of their schemes was to blow up the St. Nicholas Church because it had been built with funds provided by the Russian bureaucracy,” she said. 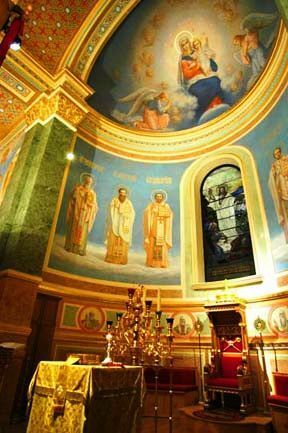 With the fall of the Csar in 1917 as the Revolution raged on, the Communists took over the Church in Russia, filling the priesthood with supporters. Eventually the wave hit New York. In 1923 the Communists sent Rev. John. 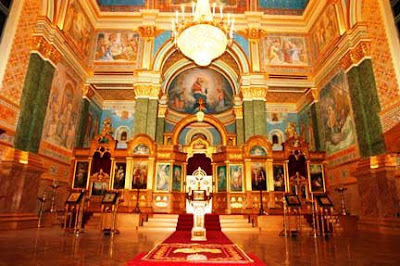 F. Kedrovsky to replace the Most Reverend Metropolitan Platon as bishop. The congregants carried Kedrovsky out of the cathedral and dropped him unceremoniously on the sidewalk. A battle for the control of the church raged on with one faction, then the other, taking possession. A New York State court, in 1925, finally awarded the church to Kedrovsky. Police were necessary, however, to get him safely into the cathedral. In 2000, with the 100th anniversary of the building approaching, a $4 million restoration was initiated under the direction of architect Stephen Papadatos including regilding of the domes, façade cleaning and interior restoration. 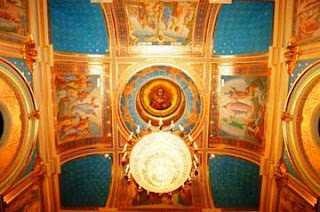 Another $1 million was spent on repair and repainting of the historic icons. 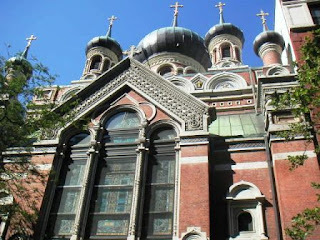 St. Nicholas Cathedral is an imposing presence on the Upper East Side, an unexpected slice of Russia on 97th Street.